Before they set foot in a dealership, Canadian car buyers go online to get their questions answered, scour reviews, and take digital test drives on YouTube. 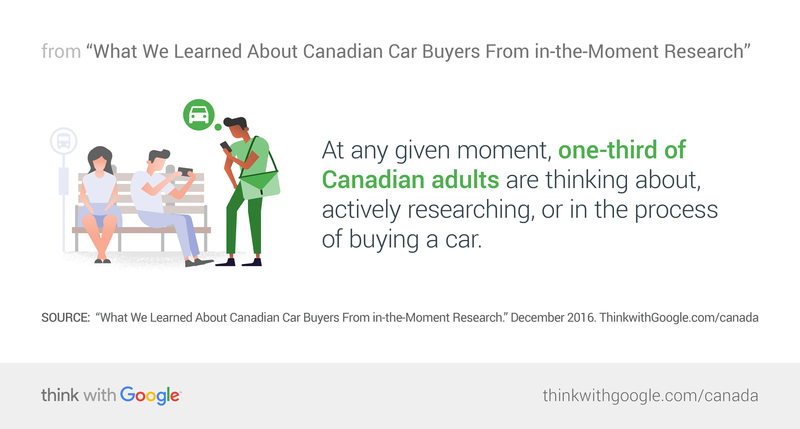 Based on new research, here are five insights and actions marketers can use to reach Canadians who are in the process of buying a car. We talked to 5,000 Canadian car buyers not days or months after they purchased a car, but right when they were in the thick of “thinking,” “researching,” and “buying.” This real-time research gave us fresh insight into how Canadians go about choosing a car and how marketers can reach them in their key moments of decision making all along the way. Canadian consumers aren’t entering the auto market sparingly or infrequently—cars are on the brain all year long. 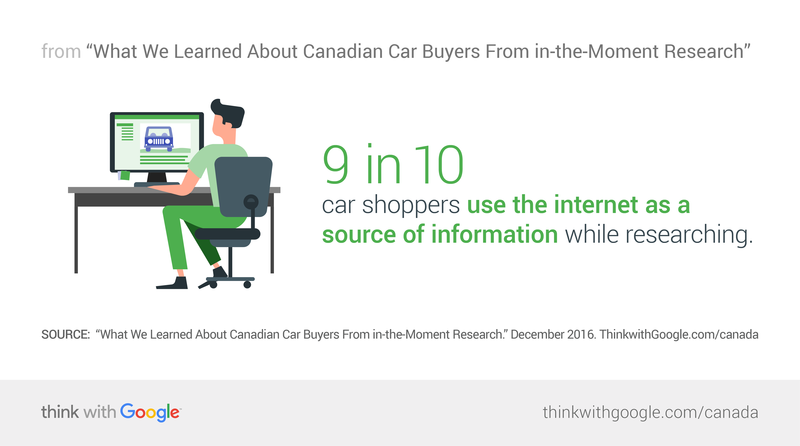 At any given moment, one-third of Canadian adults are thinking about, actively researching, or in the process of buying a car.1 Millions of consumers are engaged in the hunt for a new car throughout the year—and they’re ready to hear from your brand. 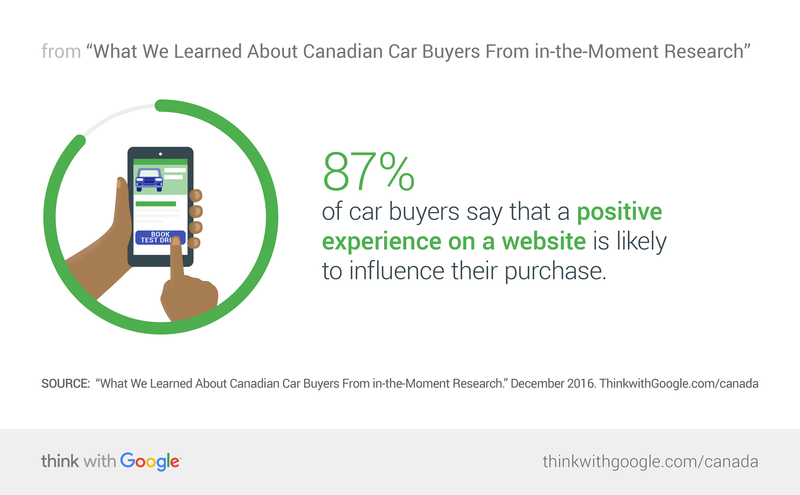 As they move along the purchase journey, car buyers turn to the internet in key micro-moments for inspiration and information. On days when in-market consumers are thinking about purchases, it’s on their mind an average of 3X per day.2 That’s three times per day that they may go online to browse cool new colours, check prices, and read up on the latest safety features. In addition to digital pushes during key sales events and launches, an always-on strategy can help reach the millions of Canadian car buyers who are on the hunt for a car at any moment. Combining always-on video, search, and display efforts can drive consideration, aid in consumer research, and drive buyers to the dealership door. The internet has become the new showroom as consumers can check out new models, features, and other technologies via online video. Pay as much attention to your online presence as your offline presence. Think about what potential customers may be looking for when they head to your website, just as you would for those visiting the dealership. Your mobile and desktop sites should be as welcoming, efficient, and useful as your dealerships. Be there when car buyers turn to the web in moments of need. Use search ads to drive customers directly where they want to go with extensions and descriptive copy. Depending on what people are searching for, copy can include information links to dealer locations, build and price tools, special offers, model comparisons, and contact information. Consumers want more than a quick overview of cars when they’re researching online. They want to investigate every detail and visualize how the car looks and feels. Create video content that will take viewers on a virtual test drive, giving them a thorough look at new features and technologies, such as infotainment systems, comfort and safety features, legroom, and even trunk space. Immersive videos, such as 360° walk-arounds, provide potential customers with detailed content and the ability to focus on the areas that are most appealing and important to them. As car buyers are online researching options and getting ideas, they keep an open mind, adding brands to (and dropping them from) their consideration set. Out of all brands being considered, any given brand has an average of a one in four chance of being chosen for the actual purchase.5 That openness is good news for brands looking to connect with and win new customers. One in four car shoppers say they’re considering a brand based on finding a better option through research,3 so as consumers research, presenting—and defending—your brand’s value prop is key to staying in the consideration set. Great ways to connect throughout a buyer’s journey are video, display, and remarketing lists for search ads. If consumers show interest in your brand when they begin their research, remarketing can help you continue to engage with them and stay top of mind. Brands can develop different strategies and messages depending on whether people have visited a contact-us page, done model comparisons, or filled out a lead form. Persistent, consistent messaging can help with awareness, but consumers may be less inclined to engage when they see the same ad again and again. Savvy marketers can stay in the consideration set by thinking about what consumers want in key micro-moments along the way. When someone searches for things like “best truck of 2016” or “most fuel efficient 7 passenger SUV,” serve up ads intended to drive brand awareness and consideration. Search interest in “car dealership near me” tripled in the past year.7 As these kinds of “near me” searches often take place on mobile, ensure all sites are mobile optimized and make it easy for customers to locate dealerships that meet their needs. Affordability is a major concern for car buyers, so consider including detailed breakdowns and comparison tools that play well on all devices. Align your marketing spend with where car buyers spend their time researching and being inspired. Optimize your media mix to include both traditional and digital tactics, ensuring that digital plays a strong role. When targeting digital consumers, extend your campaigns’ location reach. These customers feel comfortable traveling farther for the car that meets their needs. 1. Rethinking your marketing strategy to align your spend with where car buyers spend their time researching and being inspired. Optimize your media mix to include both traditional and digital tactics, ensuring digital plays a strong role. 2. Prioritizing great online user experiences across all screens and devices. Provide seamless experiences to better enable, service, and measure digital interactions. 3. Making the most of all the tools digital offers. Maximize the power of search and data to serve up the most relevant information in the moment. Video can help you connect emotionally with customers through sight, sound, and motion. 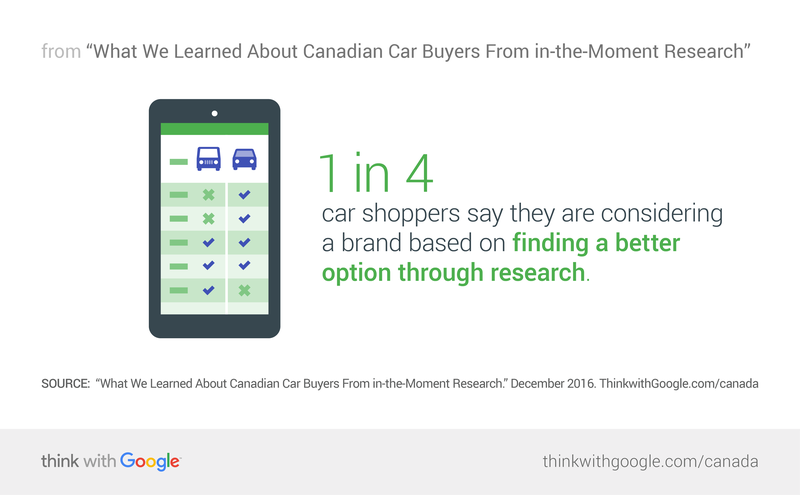 In partnership with Ipsos, Google Canada conducted online, device-agnostic quantitative research into the Canadian car buyer journey. The survey was conducted from June 23 to July 11, 2016 among a representative sample of n=5,000 Canadians 18+ currently in the process of buying a car, n=1,500 Canadians in the “thinking” phase, n=1,500 in the “researching” phase, and n=2,000 in the “buying” phase. The sample was balanced to reflect the demographic profile of Canadians in the market for a vehicle..
1 Google Canada/Ipsos, “Canadian Car Buyer Journey 2016,” September 2016, n=5,629 online Canadians 18+; balanced clicks approach was used to get overall incidence among Canadians 18+. 2 Google Canada/Ipsos, “Canadian Car Buyer Journey 2016,” September 2016, n=4,531 auto intenders. 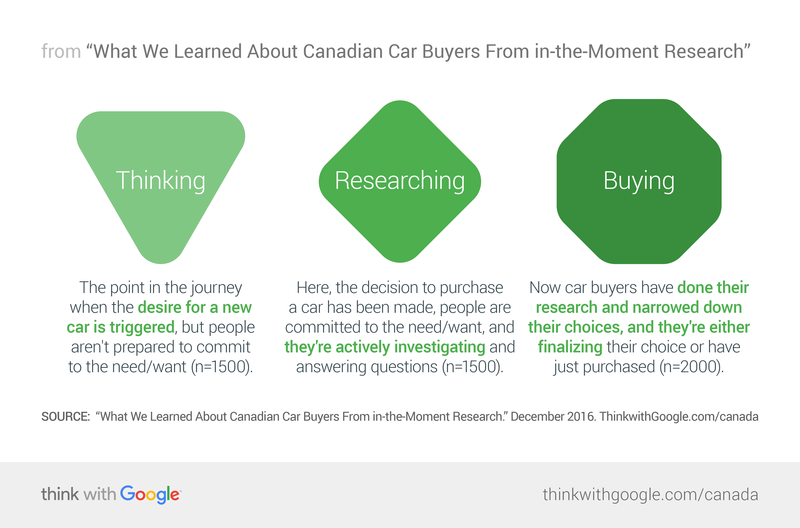 3 Google Canada/Ipsos, “Canadian Car Buyer Journey 2016,” September 2016, n=1,509 research phase. 4 Google Canada/Ipsos, “Canadian Car Buyer Journey 2016,” September 2016, n=5,016 online Canadians 18+. 5 Google Canada/Ipsos, “Canadian Car Buyer Journey 2016,” September 2016, n=16,433, overall aggregate conversion rate across all brands considered. 6 Google Canada/Ipsos, “Canadian Car Buyer Journey 2016,” September 2016, n=1,887 car buyers. 7 Google Trends, April 2015 vs. April 2016, Canada. 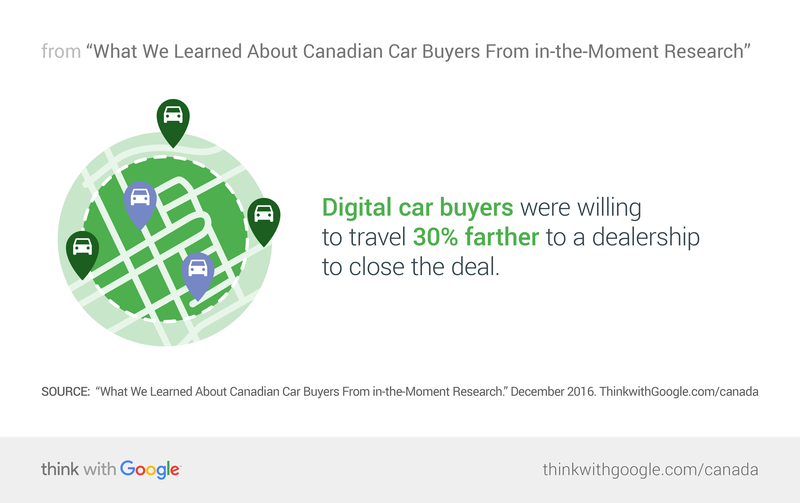 8 Google Canada/Ipsos, “Canadian Car Buyer Journey 2016,” September 2016. "Digital person" here refers to those who used five or more digital sources (n=2,341) vs. those who used only traditional sources (n=577).